In a recent weekend trip to Morro Bay, we were trying to find a relatively nice sit-down restaurant to dine on Saturday evening. Many of the oceanfront restaurants seemed to cater to tourists and a brief glance of their menus didn’t spark any interest. After doing a brief search on Yelp!, we decided to check out the menu at The Galley Seafood Grill & Bar and a place to stay at the adjoining inn. Although the inn had booked out along with every inn on that street, the manager recommended we make reservations in advance for The Galley. The host, John, was very friendly and took our reservations for 8:30pm. After a few hours of walking around and realizing that Morro Bay is a small retirement ocean-side town that, after the peak summer season, had very little to do, we decided to arrive at The Galley a full hour early. John, who had seen us hovering around over the menu outside deciding in advance what we wanted to order, came out and offered to seat us earlier if other parties had not arrived by 8:15pm. It was difficult not to notice how busy they were despite being in the off-season. We even noticed John turning away other parties due to the number of reservations. We came back later and by this point, both he and another staff member had recognized us and immediately showed us to our table. We were seated in a corner section in the dimly lit Galley which was frequented by an older and local crowd. 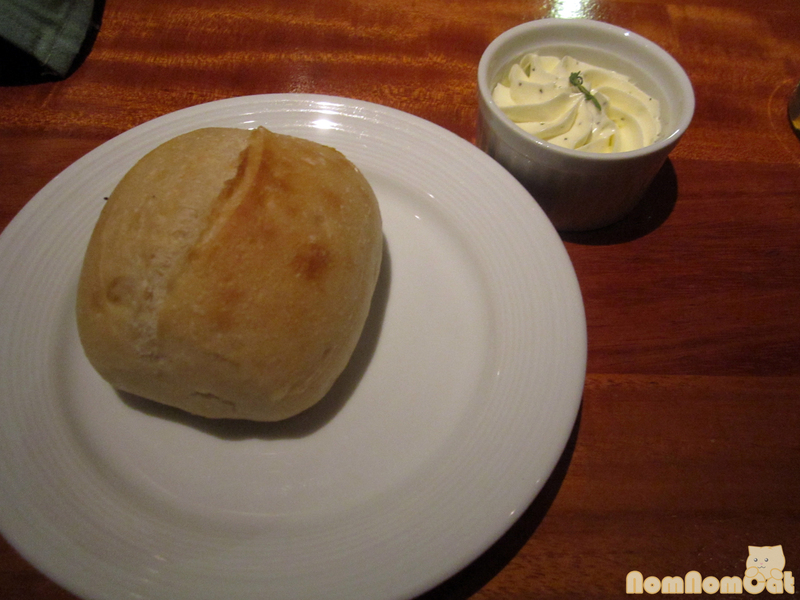 Let’s start with the table bread. Alice and I are both suckers for warm ciabatta and look what they had…mini ciabatta loaves, served with homemade whipped herbed butter. We decided to splurge, ordering up a half dozen oysters that, according to our server Jennifer, came from British Columbia. These things were ginormous, a lot larger than the Fanny Bay varieties served at seafood restaurants in Santa Monica and Venice during happy hour. 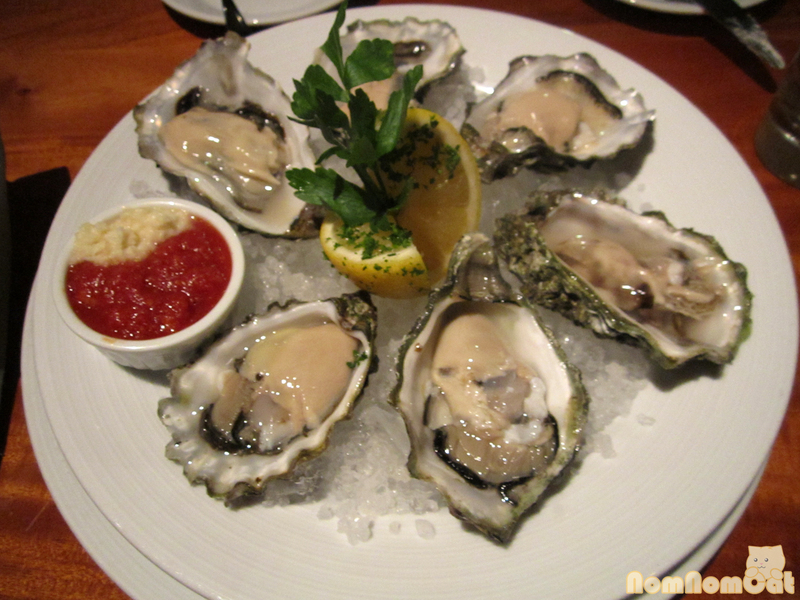 They were sizable and very briny, delicious. Alice knew exactly what she wanted for her entree, the Pan Seared Scallops, a Galley specialty. 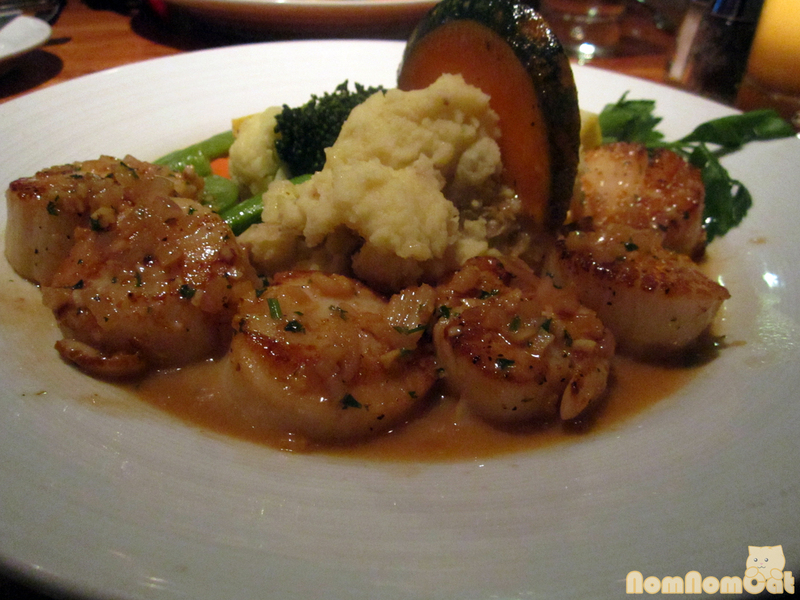 The scallops were moist and perfectly cooked — a beautiful golden sear on the outside, nice and opaque on the inside. The garlic mashed potatoes, made with Yukon Golds, was flavorful and even better with the pan jus drizzled on the plate. The assortment of steamed vegetables were well cooked and nothing was soggy. Bringing a bit of autumn into the kitchen, the “garnish” was a slice of steamed kabocha, wonderfully sweet and starchy. 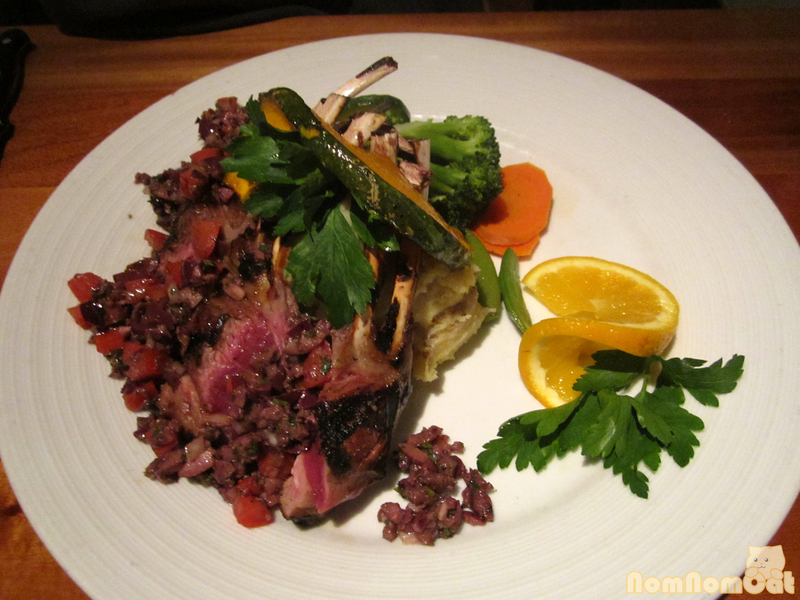 Torn between the Blackened Local Snapper, Pan Seared Scallops, and Rack of Lamb, I asked Jennifer for her recommendation but she made a simple suggestion: get what you crave. Rack of Lamb, rare, was the final verdict. I had to ask her if they would be able to do that because some restaurants refuse to serve lamb rare in fear of diners getting sick, but Jennifer seemed confident that their quality was high enough to serve it however I wanted. The lamb was amazing, very tender on the inside and seared to a slight crisp on the outside. Again, a very sizable portion with 4 double-ribs. I wasn’t a huge fan of the Kalamata tapenade but that is a personal preference. The garlic mashed potatoes, tucked under the rack of lamb, were a big hit as well but I wish they had given a larger scoop. 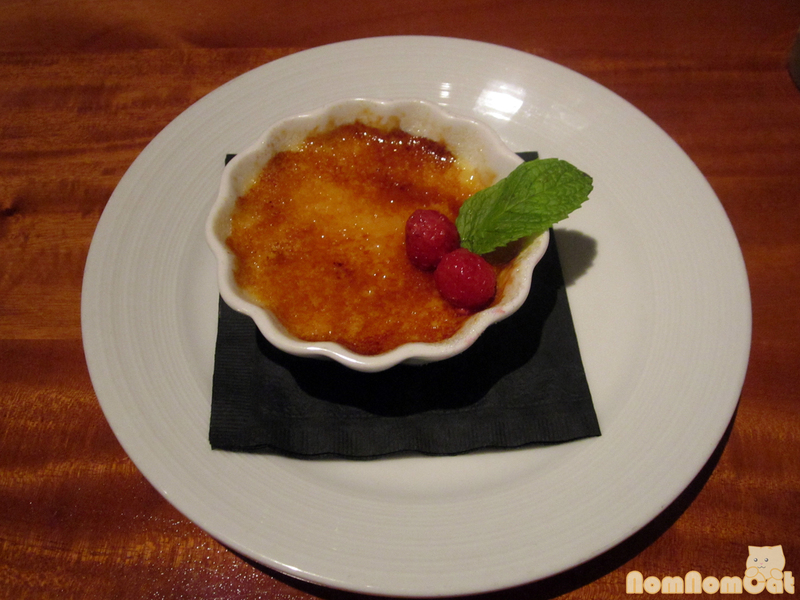 After Alice and I polished off our plates, we finished up with the Grand Marnier Crème Brûlée. I amused myself for the longest time saying the name while waiting for our dessert, it just rhymed so well! (Try saying it out loud, noting that Marnier is pronounced like marn-yay, not mar-nee-er.) I have to say this crème brûlée marginally overtook the Vanilla Bean Crème Brûlée we had at Opal in Santa Barbara, which, for its simplicity, was very high in quality. However, the Grand Marnier added an extra citrusy zing that was different from just vanilla beans. Five stars for sure. Overall it was a great experience with phenomenal service through the whole night, even before we were seated. The food was excellent and the staff extremely accommodating. Shout out to John for his amazingness of working to getting us seated earlier than expected and Jennifer for being so attentive to our needs and excellent recommendations. 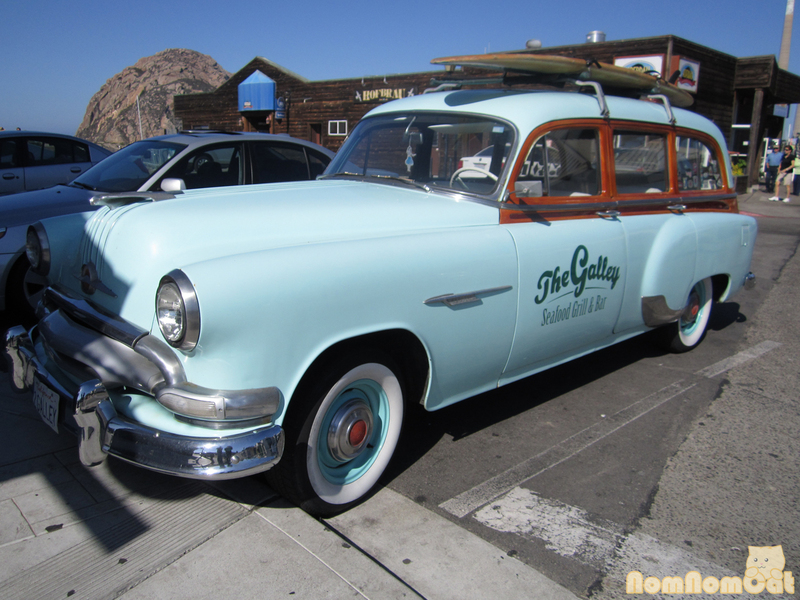 We will definitely be back if we find ourselves in Morro Bay again.